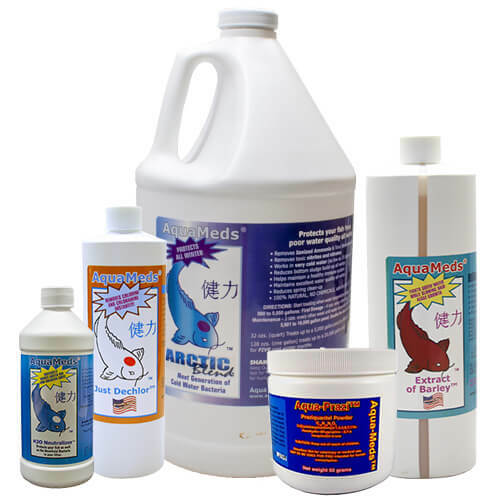 Aqua Meds Products Our complete selection of Aqua-Meds pond treatments and antibiotics will help remedy flukes, fungus, parasites, bacterial issues, and other common diseases that can harm your fish population. When it comes to fish medications and natural beneficial pond bacterial treatments look no further than Aquameds. Our complete selection of Aqua-Meds pond treatments and antibiotics will help remedy flukes, fungus, parasites, bacterial issues, and other common diseases that can harm your fish population. We stock everything from Aqua-Medzyme, Aqua Prazi, to products like Clear Shine, Sludge Remover and Organic Control to help keep your pond clean and clear. Choosing the right medication or additive for your pond starts with Aqua Meds. Find natural beneficial bacteria - liquid and dry, conditioners, chemical flocculants, and other water treatments here. Offering Aqua-Prazi for treating deadly flukes and Medzyme for reducing deadly waterborne bacteria. Reduce DEADLY Water Borne Bacteria in your pond. Aqua MedZyme Dry reduces the deadly bacteria in your pond by starving them to death. These deadly bacteria live in every koi fish pond, causing life threatening bacterial infections attacking koi when they are stressed, causing thousands of fish deaths each year. Aqua MedZyme Dry consumes the same food that Aeromonas, Pseudsomonas live on and starves them to numbers so low they become harmless to your koi & pond fish. 5,001-10,000 gallons First Dose Double the dosage. Summer Blend is an excellent summer conditioner for your filter and pond! Summer Blend will improve the efficiency of your filter, regardless of its size, by aiding in reducing the heavy bio-load during the summer months. Plus, it will give your filter the boost it needs to keep your pond water non-toxic during those hot summer spikes of ammonia and nitrite, by removing excess ammonia and reducing fish waste. Keeps your pond water clear with its special blend of unique sludge eating microbes which are 100% Natural, NO harsh chemicals or medications. Tested and proven in commercial situations with extreme environmental conditions. One easy treatment every other week. The NEXT generation of pond water clarifiers! New double strength Clear Shine treats three times as much pond water as other brands. Restores your pond water to a brilliant shine and increases the efficiency of your filter. Add One Ounce of Clear Shine for every 2,000 gallons of pond water. Mix Clear Shine with one gallon of pond water BEFORE adding it to your pond. Add to TOP of waterfall or in your skimmer. If a second treatment is needed, wait 24 hours before applying. For ponds over 8,000 gallons DO NOT add more than 4 ounces per treatment. Aqua MedZyme permanently reduces ALL strains of deadly ulcer causing Aeromonas, Pseudomonas in your pond by starving them to death. These deadly bacteria live in every koi fish pond, causing life threatening bacterial infections such as ulcers, fin rot, tail rot and more. Attacking koi when they are stressed, causing thousands of fish deaths each year. Aqua MedZyme contains 760,000,000 yes, seven hundred and sixty million hungry beneficial bacteria per ml that eat the same food as Aeromonas, Pseudomonas, which starves them to levels so low they can not harm your fish. Shake well before using. Turn off U.V. sterilizer during the first three treatments only. Add 4 tsp (20 ml) Aqua MedZyme per 1,000 gallons of pond water once every three days for 3 treatments. Next add 4 tsp (20 ml) Aqua MedZyme per 1,000 gallons of pond water once every week for two weeks. Maintenance: Add 2 tsp (10 ml) Aqua MedZyme per 1,000 gallons of pond water once a week to maintain proper water quality. Professional strength, concentrated beneficial bacteria. Especially formulated for rock and gravel bottom ponds! For the 1st application of the season, mix 2 oz. of sludge remover per 1,000 gallons in a bucket with several gallons of pond water. Disperse mixture into areas of the pond with adequate circulation. Reapply 1 oz. per 1,000 gallons every two weeks. Turn off U.V. sterilizer for 48 hours after application. Maintain sufficient aeration during treatment. Protects your fish from harsh chemicals added your tap water by your local water department. The chloramines in your tap water are made up of chlorine and ammonia. If you use a dechlorinator that only removes the chlorine, yes, it will destroy the chloramines, however, it will leave all the toxic ammonia in your pond water. DeChlor & More instantly removes ammonia, chlorine and chloramines. Mix with 2-3 gallons of pond water, distribute evenly around pond. Dosage can be increased to remove greater amounts of ammonia.